Asking just $10.00 -- MUST SELL -- Make me an Offer !! Buyer to pay U.S. Shipping, or items can be picked up. Cash or Money Order only. Make a Wonderful Gift ! 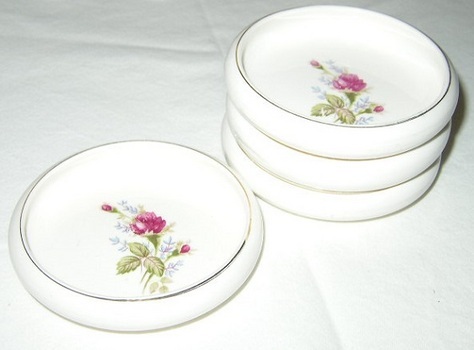 Nasco, Moss Rose Pattern - Bone China, Coaster Set with 22kt Gold Decoration. All Items in Excellent Condition (Never Used). Bottom Stamped with Floral Emblem, says "Nasco Moss Rose, 22K Gold Decorated." Each Coaster measures 3-3/4 (across) x 7/8 inch high.